I love General Tso's Chicken! I ate more of this dish in college than any other meal. Main Moon made great, cheap, fast Chinese food. One order could feed me for three days...once I got that refrigerator. Now with three kids our food outings and take-out usually revolve around pizza. When I found this recipe on Favorite Family Recipes, I had to try it! Despite the large number of ingredients, it was super easy. My husband was astonished that such a meal could come out of my crock pot. Combine flour, salt, and pepper in a bag. Add chicken. Shake to coat. Heat oil in large skillet over medium high heat; cook 2 minutes per side. In the crock, mix sugar, soy sauce, pineapple juice, vinegar, garlic, ginger, and cayenne. Whisk. Add chicken. Cook on low for 3-4 hours. Serve over rice or quinoa. Garnish with green onions. Note: the cornstarch acts as a thickening agent if you feel your sauce is too thin. I am not really the type to "sneak" veggies into things because I am fortunate enough to have kids who are at least willing to tolerate them (if not enjoy them) when they are perfectly visible. However, when faced with the opportunity to make a family favorite healthier by adding pureed acorn squash, I decided to go for it. Little did I know that not only would it be healthier, it would taste awesome, too. My family gobbled up this delicious mac and cheese! While water is boiling for the pasta, scrape the cooked squash from the skin and place in a food processor or high speed blender with 1/2 cup of milk. Blend until pureed. While pasta is cooking, melt the butter in a large skillet over medium heat. Add the flour and nutmeg, whisk for 2-3 minutes. Add remaining milk, whisk until smooth. Increase heat and bring the flour/milk mixture to a boil, whisking the entire time. Once thickened, turn the heat to low and whisk in the squash and rosemary and salt and pepper as desired. Add the cooked macaroni to the mixture and combine thoroughly. Pour half of the noodle and sauce mixture into a greased 2 quart baking dish. Sprinkle 1 cup of cheese on top. Add the remaining noodle mixture and then the other cup of cheese. Sprinkle breadcrumbs on top. Bake for 25-30 minutes or until melted and bubbling. Let rest for 5 minutes before serving. We are early risers in my family and love starting the day with a big meal-especially if we have a day of outdoor adventures planned. While I often throw bags of dry cereal to my kids through the minivan, I try to prep one or two breakfast meals a week. This breakfast pizza was a hit with everyone. The crescent roll crust makes a big difference; the flaky, buttery bottom was perfect with the savory toppings. It would be easily adapted to use fresh produce like mushrooms, onions, and peppers as toppings. I prepped mine the night before and baked it when I got up. It was a great addition to a co-worker's baby shower; for easy serving, I cut with pizza cutter and stacked in a Pyrex dish layered with wax paper. No need for forks and knives for this (I remembered to make it, cut in, and put it in the car on the last Friday of the year...utensils would be way too much for me to handle). Evenly sprinkle sausage, hashbrowns, and cheese over dough. In a bowl, beat together milk and eggs. Pour egg mixture over top over toppings on crust. Bake at 375 degrees Fahrenheit for 30 to 35 minutes, until crust is browned and center of pizza is done. My son is obsessed with a board book called YUMMY COOKIES: Baking with Kids. Any guess which children's character decorates the cover? Andrew pages through until he finds his favorite Sesame Street cast members-Cookie Monster and Big Bird are the ones that get the loudest yells. Now, that he's figured out I can make the pictures in it...I've been busy. We picked this recipe because I had an open can of packed pumpkin from some experimenting in the kitchen trying to make my own pumpkin pudding. It's a keeper! My kids loved helping measure the dry ingredients. They also helped add the oats and cranberries; each taking turns stirring. These cookies got high praise from my kids and husband. Preheat oven to 350 degrees Fahrenheit. Line 2 cookie sheets with parchment paper. Sift the flour, cinnamon, salt, nutmeg, and baking soda into medium bowl. Beat in the egg and vanilla. Add pumpkin; beat at low speed until well blended. Add dry mixture; mix until just blended. Add oats; mix well. Stir in cranberries. Drop by tablespoonfuls 2 inches apart onto cookie sheets. Bake for 12 minutes. Cool on cookie sheet for 1 minute; transfer to rack to cool completely. When I think of my first baking experiences, I think of making these cookies with my mom. Simple and delicious, sometimes nothing beats a traditional chocolate chip cookie. These are always among the cookies that I make at the holidays, and they are one of the few that I will make throughout the year, as well. They are so good and easy that I almost always double the recipe and throw some in the freezer. My kids enjoy making them with me, just as I did with my mom. Preheat oven to 375 degrees. Cream together shortening, sugars, egg, and vanilla until light and fluffy. Thoroughly stir together flour, salt, and baking soda; stir into cream mixture. Blend well. Stir in chocolate chips. Drop from teaspoon 2 inches apart on a non-stick baking sheet. Bake for 8-10 minutes. Immediately remove from cookie sheet to cool. Makes about 3 dozen cookies. Speaking of boxes, we were asked by Ocean Spray to sample and review the Concord Foods' Fresh Cranberry Bread Mix. It is a seasonal item; only available during the cranberry harvest season which runs through December 31. My family loved the bread; it was a nice surprise on a cold, Saturday morning. I used fresh cranberries, but if they weren't available, the box recommends soaking Craisins in warm water-I always have those on hand. I chose to use 3 small seasonal loaf pans as I experimented with homemade gifts. My extended family is growing to include fiancees and boyfriends; everyone comes to MY house and, I want to have something to give them. The decorative pans filled with fresh cranberry bread, wrapped in clear cellophane tied with twine will dress up my holiday table while also making a tasty, inexpensive gift. You really can't get any easier than following the directions on the box of Concord Foods' Cranberry Bread Mix for a yummy seasonal treat, but we also wanted to take advantage of the versatility of this mix and try something different. I needed only a few extra ingredients, which I already had in my pantry, to make a dessert definitely worthy of a Thanksgiving buffet. Both Ocean Spray and Concord Foods have additional recipes to include one of Mother Nature's super fruits, the cranberry, in your holiday desserts. Try this recipe for Cranberry White Chocolate Orange bars, and then enter to win a great gift from Ocean Spray! ENTER BELOW TO WIN A BAG OF CRAISINS, A BOX OF CONCORD FOODS CRANBERRY BREAD MIX, AND A BRAND NEW CALPHALON LOAF PAN! Preheat oven to 350°F. Spray a 9" x 13" baking pan with non-stick cooking spray; set aside. In mixer bowl, combine Cranberry Bread Mix, water, egg and orange zest. Beat on medium speed, scraping bowl often, until well mixed (1 to 2 minutes). By hand, stir in cranberries, white chocolate chips, and pecans. Spread into prepared baking pan. Bake for 20 to 25 minutes or until edges are lightly browned. Remove from oven and cool completely. To make glaze: In mixer bowl combine all glaze ingredients. Beat at medium speed, scraping bowl often, until well mixed and creamy (1 to 2 minutes). Spread glaze on top of cooled bars. Time: 10 minute prep time; 20-25 minutes baking time. I always thought that my family wasn't big on soup. Recently, I realized the truth: We/they aren't big on canned soup. But if I make a batch of homemade potato soup in the slow cooker, for instance, that is another story. Enter this tortellini soup...this amazing tortellini soup. Full of good stuff (like carrots and spinach) that blends so well with favorite flavors, this hearty soup is easy to make and has become my new favorite, for sure. I guess we are soup people, after all! If using frozen tortellini, put bag in refrigerator to begin to thaw. Combine all other ingredients in the slow-cooker. Before adding tortellini, break up chunks of cream cheese with a whisk. Stir in tortellini. Cover and cook for 20-30 minutes until tender and hot. My kids' teachers have been GREAT this year, and have tolerated quite a bit, to be honest. I have no idea how preschool and Kindergarten teachers do it. I teach high school students and I know the patience that requires! That being said, when listening to stories of the day, we have often said, "Wow! That was really nice of Miss So-and-so, wasn't it?" In response, my kids have decided that they want to do something nice for their teachers. Specifically, they wanted to make cookies. Not wanting quite the project would entail on a weeknight, I decided that we would instead make them this treat, which is well-known and popular and absolutely delicious. I could never make a batch without plans to give most of it away...I just have no self-control. Be aware of peanut allergies and corresponding rules of your child's school if sending this snack to teachers! In a medium bowl, add peanut butter, butter, and chocolate chips. Microwave on High for 45 seconds. Stir. Microwave for 45 seconds longer. Stir. At this point, the mixture should be smooth; if need be, microwave for 20 seconds longer. Stir in vanilla. Pour chocolate mixture over the cereal and gently mix until coated. Put 3/4 cup of confectioner's sugar into each of two gallon-sized resealable bags. Put half of cereal mixture into each bag. Gently toss until coated. Spread on parchment paper to cool. Time: depends on if the kids are helping! This takes me about 30 minutes when my 6 and 4 year old help with the measuring, mixing, etc., but it takes less than half of that if I am doing it by myself. Source: I think I may have made this with a friend in high school the first time. It was her mom's recipe. I never make lasagna; it seems really involved to me, and I really don't want a whole tray of lasagna. So...I was trying to find a way to get rid of my extra wonton wrappers after making amazingly good taco cupcakes...I came up with this recipe. In our house, we like things spicy so I include hot sausage in my meat mixture; you can just use more ground meat or ground turkey if you prefer a milder taste. Brown and drain hot sausage and lean ground meat. Add sauce to meat mixture. Spray 12 yield muffin tray with cooking spray. Place a wonton wrapper in the bottom of each tin. Put ricotta cheese in the bottom of each wonton wrapper. Layer meat mixture on top. Bake at 375 for 10 to 15 minutes. Time Management Tip-I buy my ground meat and sausage in large quantities and usually freeze in 1 pound increments. I will thaw 2 pounds of meat and brown it all in one large skillet. After I drain the meat, I divide into 4 portions. I keep one portion for the meal and bag, label, and freeze the other three. Next time, all I have to do it reheat or throw in a pot with spaghetti sauce. Source: I was inspired by the taco cupcake! We have had a lot of adjustments to make in our family this year, with this being the first year that our kids are attending two different schools with two entirely different routines. At my daughter's school, breakfast is provided at around 9 am. She arrives prior to 7 am, so we send her with a piece of fruit that she eats when she gets there and she is good until breakfast time. My son, on the other hand, arrives at school at 6:35 am and his lunch is at 10:50. He has the option of purchasing breakfast in the cafeteria, but we prefer to send him with a breakfast to hold him over until lunch. So far, this has been a favorite. I make a batch on Sundays, put them in the refrigerator, and heat them in the microwave in the mornings. In a small bowl, whisk together eggs, seasoned salt, and pepper. Pour into the same pan and scramble until no liquid egg remains. In a large bowl, prepare muffin mix according to package directions. Fold in sausage, scrambled eggs and 1/2 cup cheese. Fill paper-lined muffin cups two-thirds full. Bake 10 minutes. Sprinkle with remaining cheese; bake 5 minutes longer or until a toothpick inserted in center comes out clean. Cool 5 minutes before removing from pan to a wire rack. One of my kids' favorite foods is meatballs. I use their love of meatballs to get them to eat other foods that include ground meat. In this recipe, along with many others, I add salsa saving me the trouble of chopping onions and peppers. It really is a time saver, and the added spice keeps my husband happy. I've made it without black beans, but my husband requested that I try to add more beans to our diet to take advantage of both the protein and fiber. Forgot the beans in the first photo...love this can opener! Mix all the ingredients, except 1/4 cup of salsa and 1/4 cup cheese. Remove from oven and sprinkle remaining cheese; continue baking 5 minutes. The start of the school year is always a whirlwind in our house! I haven't been meal planning as well as I should. And some days that Pizza Hut drive-thru across for daycare is too tempting so I throw out my plan and bring home pizza. With special events coming up everywhere and the extra expenses of the holidays, I don't have time to not be prepared and have to stick to the budget. This is one of Joyce's recipes that I haven't made yet. I finally decided to try it after about 4 mentions about how good it is from my friend Jennifer. I'm looking forward to a one dish dinner. I am trying to get my kids to eat an actual warm meal on dancing night. Last year, I packed a lunch box with items we could eat quickly and easily in the car...let's just say when you don't always check the back of the minivan you might have some messes. We love these sandwiches on rolls with pepper-jack cheese. John and I love this chicken dish; the kids enjoy finding the pieces of pineapple. I serve this on quinoa instead of rice for the nutritional benefits. We're having a fall feature pot-luck for lunch. I'm bringing something easy...I can throw everything in the mini slow cooker, and it will be ready before the first lunch. Since my coworkers are great cooks, I know I'll eat too much at lunch so leftovers for dinner work. I prepare jumbo shells then shove frozen meatballs in them, cover with sauce and some Italian seasonings in a baking dish and top with mozzarella cheese. Bake for 20-30 minutes, and my kids are super happy. I pick up pizza crusts and sauce whenever they are on sale. I'll pull some out of the freezer and let John feed the kids dinner since I get to go out for my book-club! We've been reading Eat That Frog-21 Ways to Stop Procrastinating and Get More Done in Less Time. We'll be heading to my parent's house for Sunday dinner. This is my family's favorite! I have a few new pumpkin desserts I'll be trying to make soon, so I figure I should make it at least once for the Fall. When I got banana peppers in my CSA, I wasn't quite sure what to do with them. Then I remembered the fabulous mustard that my neighbor made last summer (that I devoured). She wasn't at home to get me the recipe when I decided I had time to make it, so I had to search the internet to find something that seemed similar. This seems to be close, and judging from the number of requests that I got for the recipe at a Labor Day party I took it to (and again this past weekend), I am not the only one that loves it. I took it to use as a dip for pretzels, but it would be fabulous on a sandwich, too. Remove seeds and stems from peppers and coarsely chop. Place in a food processor or high powered blender and process until smooth. Return the mustard to boiling to thicken. Remove from heat and cool. 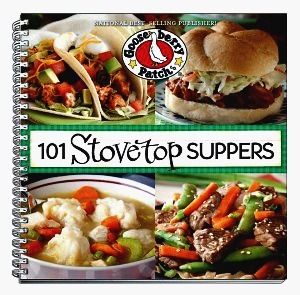 During my last few days of summer break, I worked through the "Quick and Easy" section of the new Gooseberry Patch cookbook 101 Stovetop Suppers. I wanted to have some options when I just didn't have enough time to prepare the slow cooker or have a ready casserole to throw in the oven. I need to have a few go-to recipes to keep me from the drive-thru while giving my kids a hot, quick meal. This cookbook did not disappoint. My family enjoyed the Sloppy Cowboys, Inside-Out Stuffed Pepper, Vegetable Quesadillas, and this Easy One-Pot Chicken & Rice. And, those recipes were only some in the "Quick and Easy" section; I didn't even work through the "Slowly Simmered" or "Serves a Crowd" sections yet! I loved being able to open the spiral ring book and stand it up to follow the recipe without having to reopen the book a million times. The recipes were easy to follow and kept me from turning on the oven. Jo Ann and Vickie now have a YouTube channel too! I used it with my girls so they could help me in the kitchen. Melt butter in skillet over medium-high heat. Add chicken and cook until heated through. Stir in broth and vegetables with remaining juice. Heat until boiling; add seasonings. Stir in rice and 1/2 cup boiling water. Cover and remove from heat; let stand 5 minutes, until almost all liquid has been absorbed. If rice is not tender, stir in another 1/4 cup boiling water; cover and cook on medium heat until remaining liquid is absorbed.